Powers/Abilities: As the embodiment of love, Mistress Love has the ability to make others feel love to whatever degree she wishes. She can thus indirectly inspire people to do wondrous things or to commit horrible atrocities in the name of love. She is immune to the affects of aging and disease and cannot be harmed by any conventional means. Though not often seen in combat, she has been shown to fire concussive beams of force, which are probably very potent. She is one of the few universal constants. Mistress Love cannot die as long as love lives on, so she will most likely be around until the end of the universe and has existed at least since the first being felt Love. History: Mistress Love is the embodiment of Love, and is at least as old as the first living being to feel love. (Defenders I#108(fb)) - Scouring the universe for a potential soul mate, the Enchantress discovered the abstract entity Love. 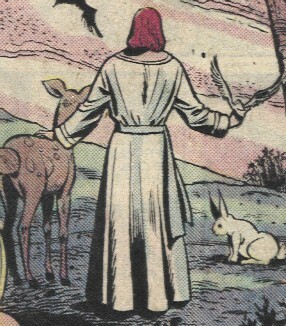 The Enchantress used her powers to draw the abstract concept into a physical form, which she saw as her ideal partner. However, in this form, Love could only exist within an isolated region in Asgard. (Defenders I#107) - From Karnilla, the Enchantress learned that the Rose of Purity could be used to give Love a more permanent form. Unwilling to leave her lover's side for any longer than she had to, the Enchantress decided to use pawns to obtain the Rose for her. To this end, she confronted the Defenders, telling them that they must retrieve the Rose for her or she would destroy the immortal form of the Valkyrie, which she had imprisoned in Asgard. (Defenders I#108) - The Enchantress sent a quartet of Defenders (Hellcat, Hulk, Namor, and the Son of Satan) to the Wasteland to retrieve the Rose of Purity. However, upon learning that the residents of the Wasteland depended on the Rose for light, hope, and happiness, the Defenders refused to take it from them. Dr. Strange stopped the Enchantress from destroying the Valkyrie to punish the Defenders. Love then spoke up, condemning the Enchantress for her selfish, hateful behavior. While Love appreciated her for giving "him" physical form, "he" knew that he could never stay wither her. Instead, Love called upon the spirit of the madwoman Barbara Noriss (who had been trapped in the Valkyrie's true body--long story!) and drew it to "himself" giving it peace and serenity as it passed on to another plane with "him." (Infinity Gauntlet#3) - Mistress Love was present, along with the other astral deities of the universe, as the Living Tribunal listened to Eternity plead his case as he argued that Thanos should not be allowed to possess the Infinity Gauntlet. After the Living Tribunal refused to interfere, Adam Warlock devised a plan and instructed the astral deities what was needed of them to thwart Thanos. Mistress Love was among these deities as well. (Infinity Gauntlet#4) - Mistress Love was among the cosmic entities that confronted Thanos after he defeated Earth's heroes. (Infinity Gauntlet#5) - Mistress Love engaged Thanos in battle along side all the other cosmic entities. In the explosive battle that followed, Mistress Love tried to use her powers to alter Thanos' feelings toward his opponents, but she failed and was repulsed by him. In the end, she was imprisoned along with all the others by Thanos. (Infinity Gauntlet#6) - After Nebula managed to steal the Infinity Gauntlet from Thanos, she unwittingly freed the cosmic entities, including Mistress Love. They all engaged her in battle. She triumphed over them, and imprisoned them once again. But before she could enjoy her victory, Warlock removed the gauntlet from her. (Warlock and the Infinity Watch#1) - Mistress Love was present at the trial of Adam Warlock, during which it was decided by the Living Tribunal that Warlock was unfit to wield the Infinity Gauntlet. (Silver Surfer III#66)- Princess Alaisa of the Kharta'eens summoned up Mistress Love to assist her in her goal of winning the heart of the Silver Surfer. Mistress Love promised to maker her his equal, and transformed her into Avatar, granting her superhuman abilities-- with the understanding that when a great struggle Mistress Love had foreseen came to pass, she would serve her. As Mistress Love departed, she warned Avatar to avoid the temptation of the dark side of love. (Quasar#37)- While touring the Dimension of Manifestations, Quasar beheld an M-body which represented Mistress Love during the time when she was held prisoner by the Infinity Gauntlet alongside the other cosmic powers. To his surprise, Mistress Love had the appearance of his girlfriend, Kayla Ballantine-- demonstrating Quasar's love for her. Quasar also witnessed the trial of Adam Warlock, at which Mistress Love was present. (Marvel: The End#4-6) Mistress Love was among the cosmic entities that confronted the newly omnipotent Thanos after he merged with the Heart of the Universe, a power source that had given Akhenaton his power. Mistress Love and the others attacked Thanos but ended up absorbed into him with the rest of creation. Mistress Love and the other cosmic entities were then restored to their cosmic stations after Adam Warlock made Thanos realize the futility of his actions. The Roman and Greek love gods and goddesses under affiliations are widely thought of as being the same being, but for the sake of making this less complicated, they are listed as separate entities. Apparently, Mistress Love took a feminine form after "her" appearances in the Defenders either because "she" thought it more appropriate to what "she" represented, because of the influence of Barbara Noriss, or (probably) because Jim Starlin thought it would work really well alongside Master Hate. Mistress Love is only referred to as a man or woman in this profile because that is the form her physical manifestation took at the time of the appearance and to make the profile much easier to write. Mistress Love is not however, really a female or a male. It is an abstract entity. The astral deities spoken of in this profile are Kronos, Love, Hate, Chaos, Order, two Celestials, Galactus, Eternity, Epoch, and the Watcher. The reason that Master Hate is listed under affiliations and enemies is because while Master Hate and Mistress Love are opposites, and both of them exist to oppose the very concept that the other represents, one of them could not exist without the other, so they depend on each other for their continued existence. The reason Anthropomorpho is under affiliations is because Anthropomorpho is the being from the dimension of manifestations that supplies all abstract and/or cosmic entities with their physical representations called M-bodies. Mistress Love is no exception and was doubtless given his form by Anthropomorpho. This is merely a physical manifestation of Love, although she exists everywhere that there is life that feels love simultaneously in a sense (in the same way that Eternity is seen in a physical form, but really is everywhere, and Lord Chaos and Master Order are seen as disembodied heads but are active everywhere). It would make sense for Mistress Love to almost never be involved in combat, seeing as it really contradicts her entire nature. Even though people often do hurt each other because of her, it is never her intention to cause pain. This is just the poet in me speaking. If you want to be really really picky, you could place Mistress Love behind the scenes every single time a comic book character had a romantic thought, act, etc. There's a good chance that we're missing some appearances (or so I'm told). If you can spot any appearances we missed and tell us about it, that'd be great. Though the male humaonid form of the embodiment of Love from Defenders I#108 appeared faceless in that issue, a recap panel in #109 shows "his" humanoid male form's face clearly. PROFILE BY STUNNER, PRIME ETERNAL, SNOOD, and WILL U.